Lemon roasted brussel sprouts are the perfect side dish. Tender brussel sprouts are tossed lemon and garlic, and then roasted until crispy, then topped with parmesan cheese! I love roasted brussel sprouts. And so do my kids. I honestly never thought that I would say that. I used to insist that I hated brussels sprouts and wouldn’t touch the things. And then I discovered roasted brussel sprouts, and I haven’t looked back. Now it’s just a matter of deciding what flavour to add to the tasty vegetable. Today – lemon roasted brussels sprouts. With garlic and parmesan. This might just be my favourite version of roasted brussels sprouts yet. 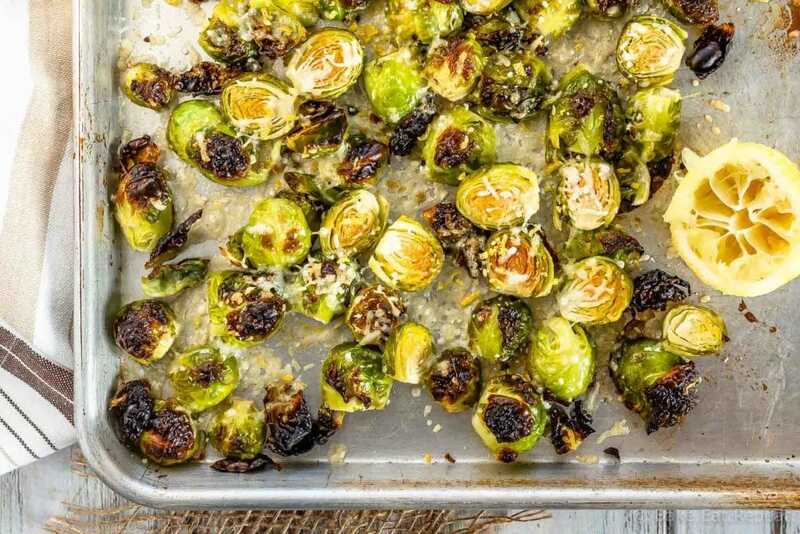 These tender brussels sprouts are tossed with lemon and garlic, topped with parmesan cheese, and roasted until crispy. Even the kids gobbled them up in no time. You know they’re tasty when you have to fight the kids for the last one, rather then bribing them with dessert to eat their vegetables! 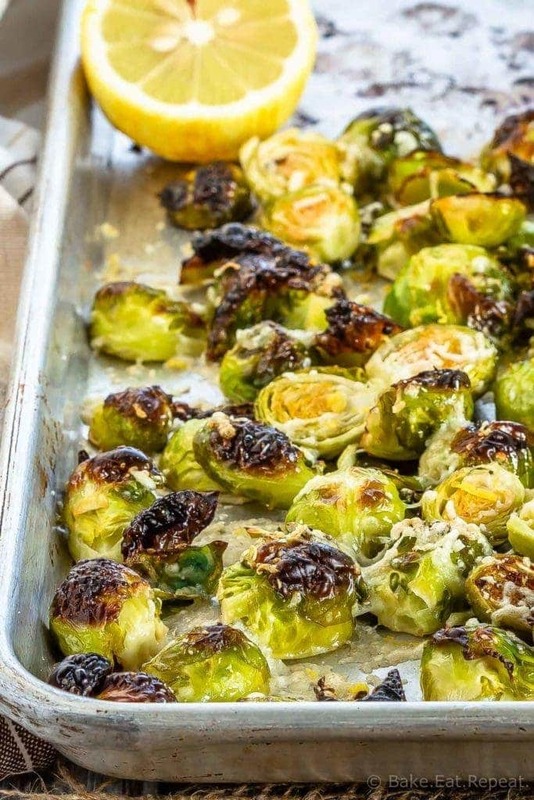 How do I roast brussel sprouts in the oven? Roasting brussel sprouts in the oven is super simple. 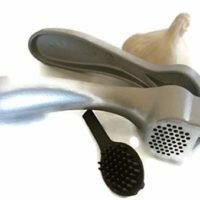 Slice the ends off, remove the loose outer leaves, toss them with some olive oil and seasonings, and throw them in the oven. 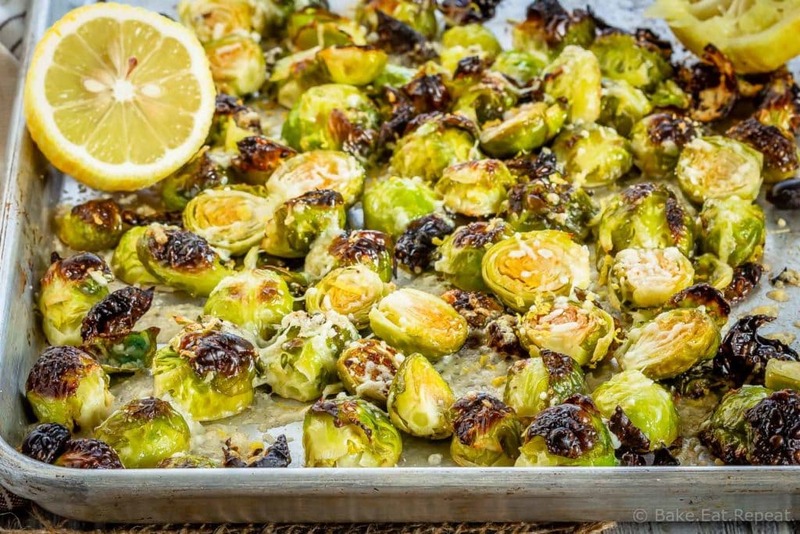 For this recipe, I tossed the brussel sprouts with lemon juice, lemon zest, garlic, olive oil, and salt, and roasted them at 425 degrees F for just 15 minutes. I like to broil them for a couple minutes at the end of the roasting time with some parmesan cheese to melt the cheese and crisp up the edges. I call them mini cabbages when talking about them to my kids, because you can pretend you’re a giant when you eat them. Have to make vegetables fun somehow, right? But if you’re curious, they’re not actually small cabbages, just part of the same family. With cabbages you eat the whole head of the vegetable that grows out of the ground, but brussels sprouts are buds that grow along a thick stalk. You can eat the whole sprout. 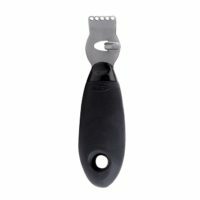 You just need to trim the dry part at the base of the sprout and pull off any loose outer leaves. Brussels sprouts keep for a couple weeks in the fridge. Smaller sprouts are usually a bit sweeter then the larger ones. Look for smaller ones if you don’t like the bitter taste they sometimes have. These lemon roasted brussel sprouts are great without the parmesan cheese too, so you can omit that if you prefer. 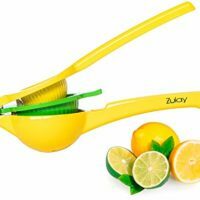 This lemon zester is fantastic for zesting your lemon, and I love this style of lemon juicer. 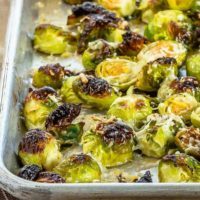 Here are a few more great brussels sprouts recipes for you: Honey Garlic Roasted Brussels Sprouts, Maple Balsamic Roasted Brussels Sprouts, and Maple Glazed Salmon and Veggies. Lemon roasted brussels sprouts are the perfect side dish. 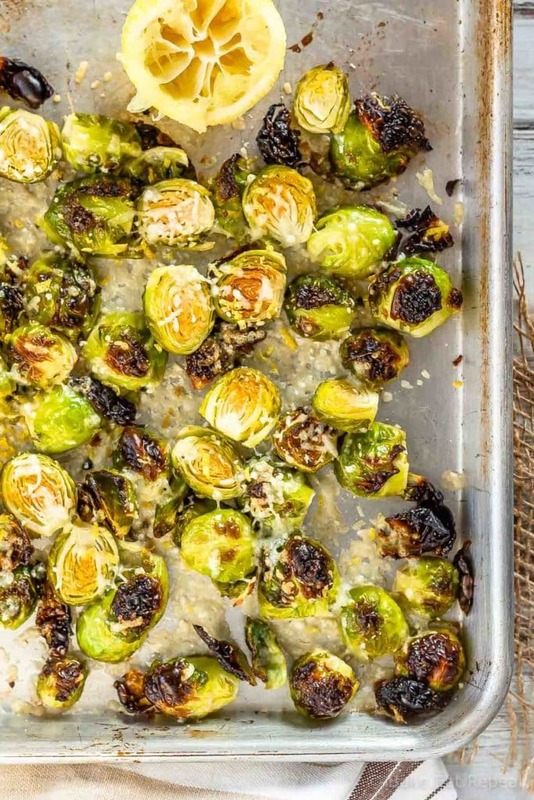 Tender brussel sprouts are tossed lemon and garlic, and then roasted until crispy, then topped with parmesan cheese! In a large bowl toss together the trimmed brussels sprouts, lemon juice, lemon zest, garlic, olive oil, and salt. Stir until well combined. Spread on a rimmed baking sheet and roast for 15-18 minutes, or until tender. Turn the broiler on high. Sprinkle the brussels sprouts with the parmesan cheese. Broil for an additional 2-3 minutes, or until the cheese is melted. Source: Adapted from my Honey Garlic Roasted Brussels Sprouts. I actually used your recipe for my roasted Brussels sprouts on Thanksgiving, but I used oranges instead because the salad had a lemon dressing. It was fabulous! Thanks. Oooh, oranges - definitely trying that next! Glad you enjoyed them!